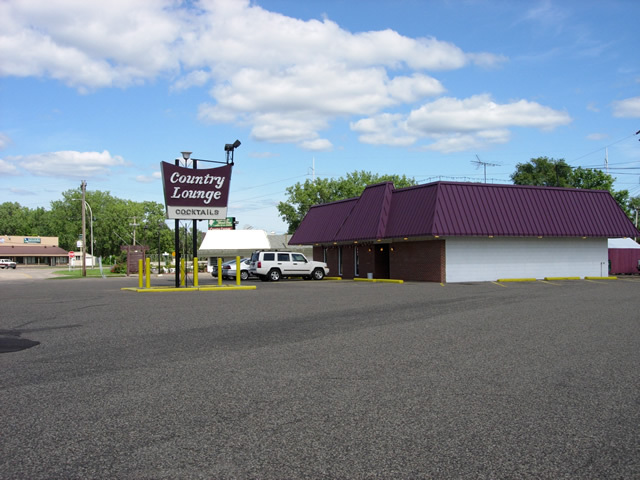 Located In: Vadnais Heights, Gem Lake, White Bear Lake, Ramsey County. 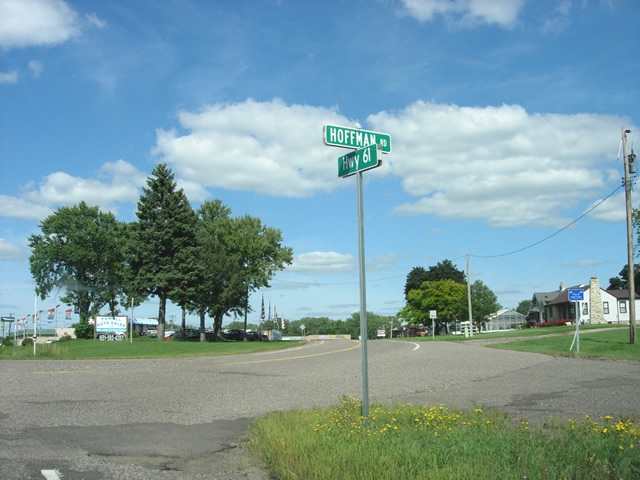 Hoffman Road was once part of the original alignment of U.S. 61 between St. Paul and White Bear Lake. 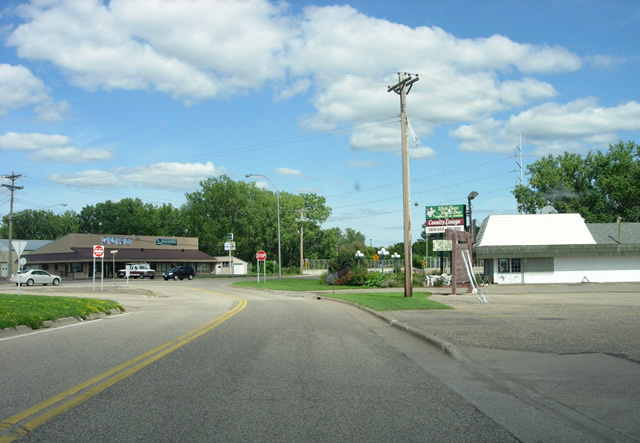 It runs along modern 61 for just over two miles from just south of County Road E to the north end of Goose Lake at the junction with County Road 65. 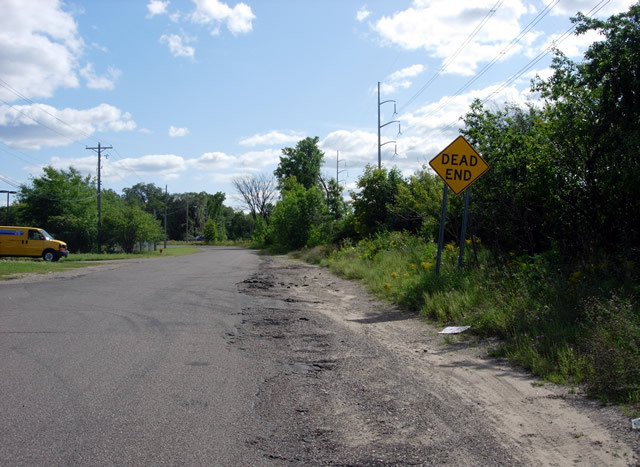 Hoffman Road was completed between 1921 and 1922 as part of the project to pave the road between St. Paul and White Bear Lake. 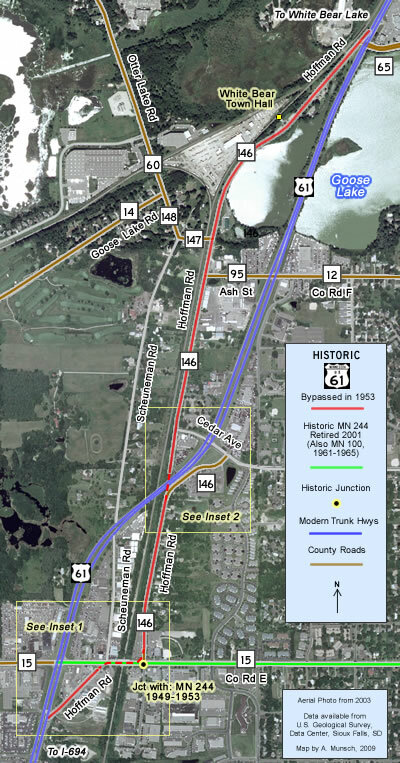 The sections south of County Road E and north of Otter Lake Road were completed 1921. The remainder in the middle was completed in 1922. 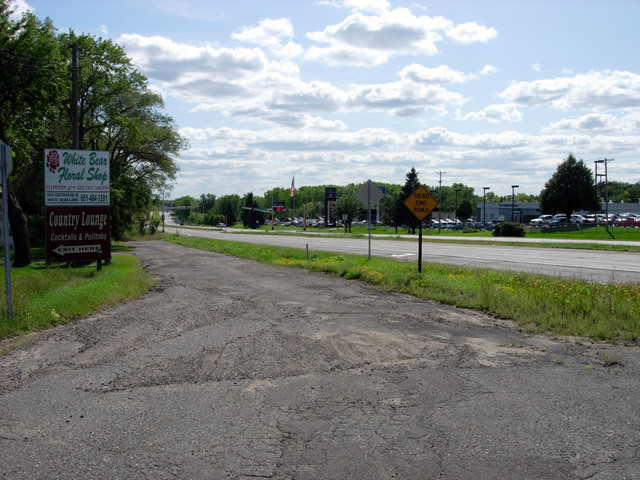 The original pavement was 24 feet of asphalt over a concrete base. The old road remained unaltered until a 1937 project widened the grade to make room for gravel shoulders. The original bridge over the railroad tracks on what is now County Road E was constructed in 1911 as a concrete girder structure. The highway made two sharp curves at each end of the crossing. 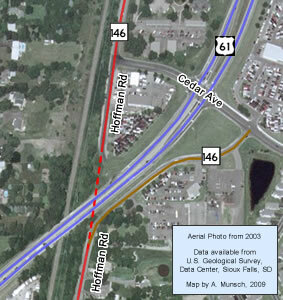 The intersection with Scheuneman Road on the west side of the bridge was shown as "Hoffman's Corner" on old highway plans. 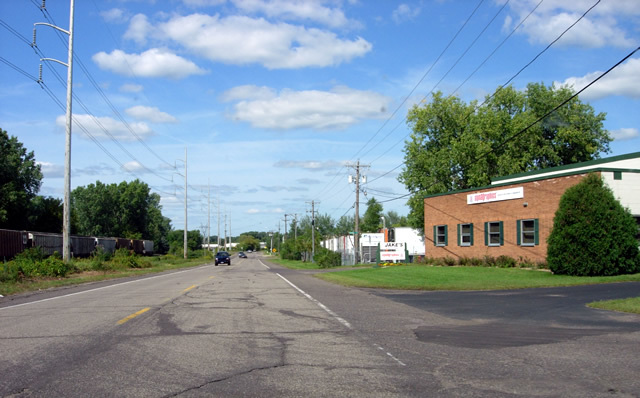 Hoffman Road was bypassed by the construction of the modern divided highway between St. Paul and White Bear Lake in 1953. 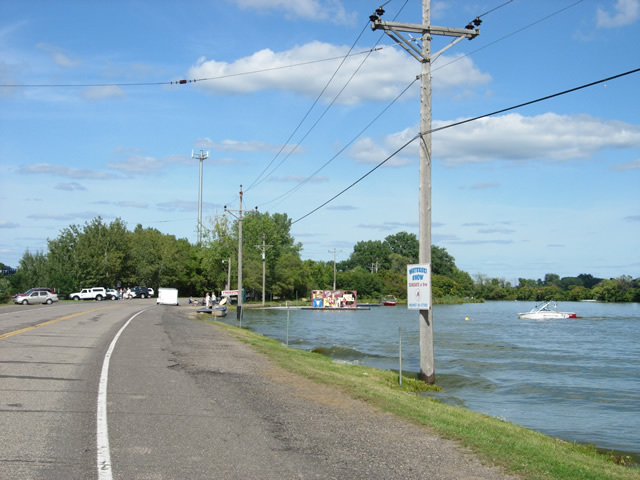 The divided road was aligned to remove several sharp curves on the old highway, requiring a fill across Goose Lake. The rail crossing on County Road E was subsequently taken over by State Highway 244. 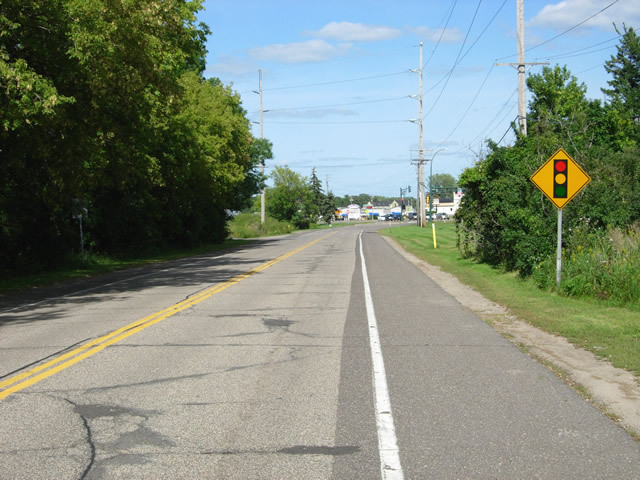 It was also marked temporarily as part of Highway 100 from 1961 to 1965. 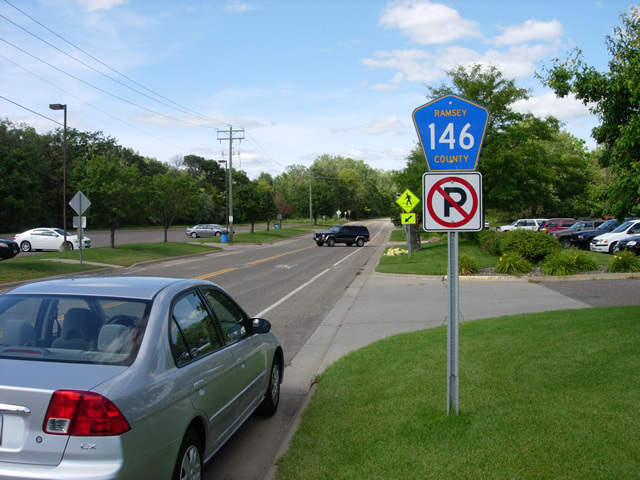 The majority of Hoffman Road is now marked as Ramsey County Road 146. The entire road has been repaved. Several sections have also been heavily rebuilt. 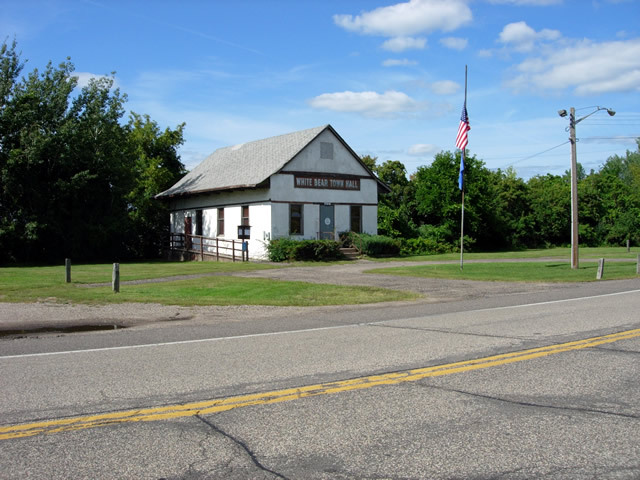 The location that has undergone the most change since 1953 is the old crossing of the Burlington Northern Tracks at Hoffman's Corner. The two curves that once marked the path of the old highway have both been removed (this took place in 1972). The old bridge over the tracks from 1911 was not replaced until 1973, when a temporary bridge was constructed just to the north to allow the old one to be torn town and replaced by the current structure (bridge no. 62079, constructed in 1978). 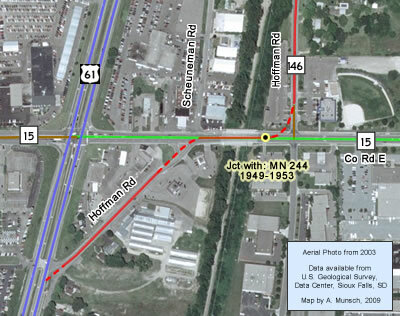 The original junction with State Highway 244, a route added to the trunk system in 1949, was located at the east intersection of Hoffman Road with County Road E.
The other big discontinuity on the old highway is the point where Hoffman Road meets modern U.S. 61 just south of Cedar Avenue. 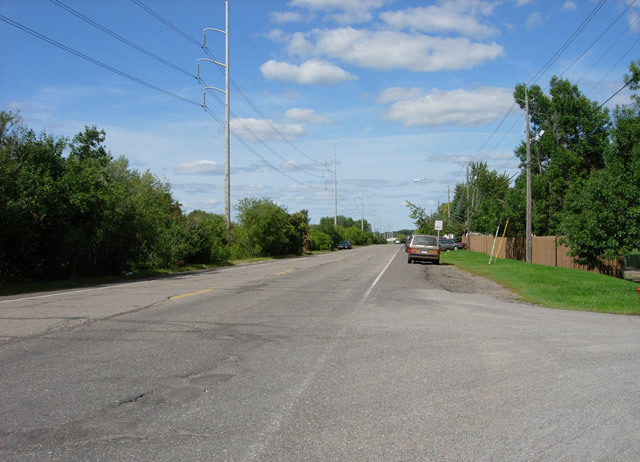 The direct crossing was closed off when the divided highway was constructed in 1953. Access to the two halves of the old highway has been maintained via Cedar ever since. The crossing was moved north to its current location in about 1981. 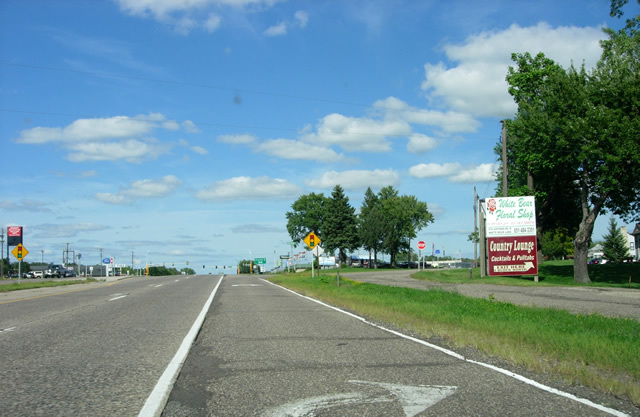 Northbound on U.S. 61, at the turn lane to Hoffman Road just south of County Road E.
The south end of Hoffman Road at Highway 61. Also note the small blue sign on the right, marking the city limits of Gem Lake. 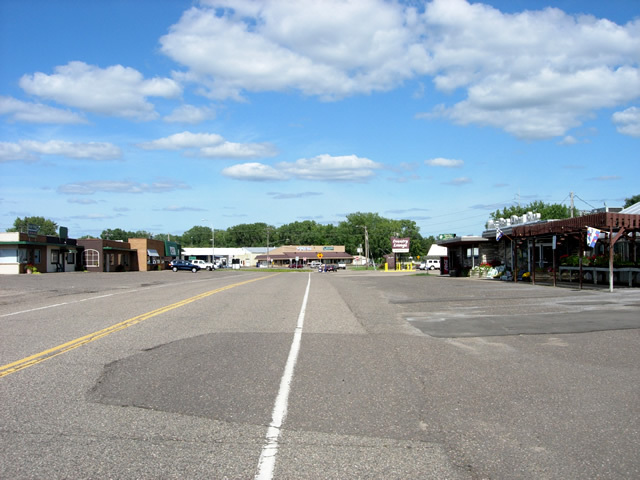 Looking south down Highway 61 at Hoffman Road. The decrepit looking road is actually a service drive constructed in 1953. 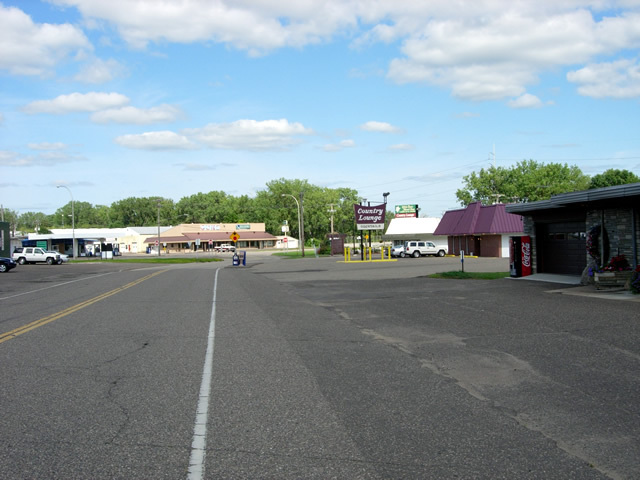 Looking north on Hoffman Road towards County Road E. This stretch of the old highway is home to several local retail establishments. 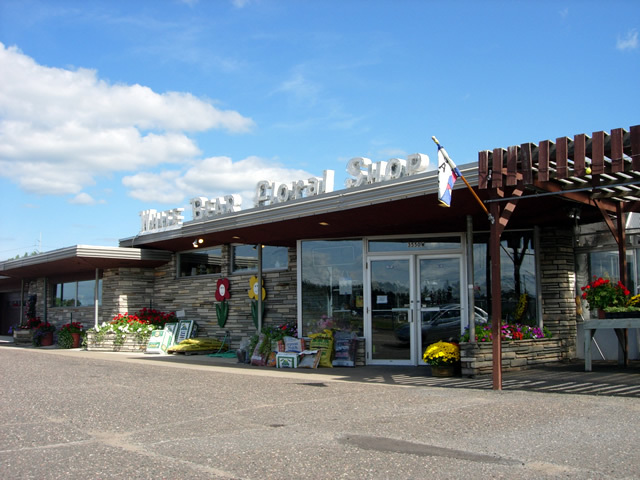 The White Bear Floral Shop, with its classic 1950's era styling. 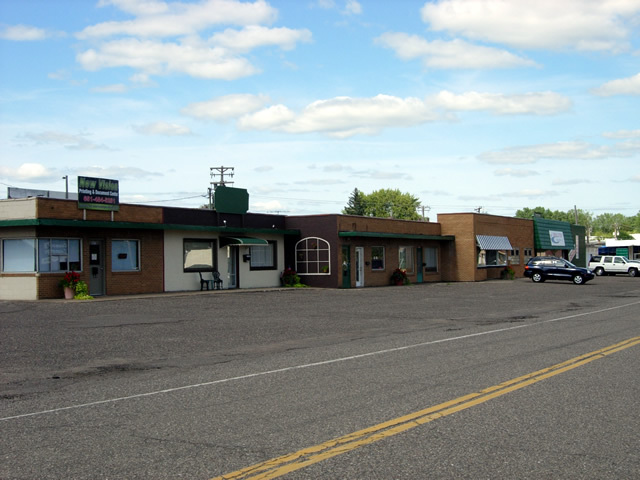 The aging strip-mall on the west side of Hoffman Road. Another shot to the north on Hoffman Road. 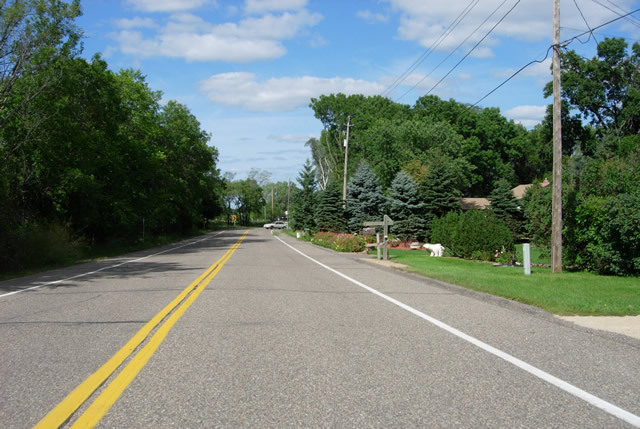 Note the color change in the pavement ahead, marking the beginning of the connection to County Road E constructed in about 1972. 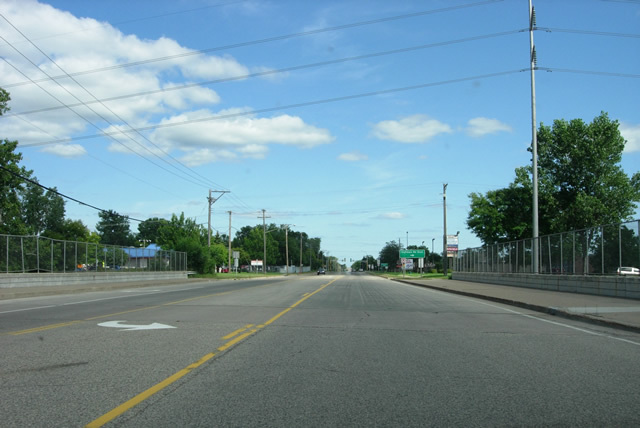 The original road continued straight ahead a little longer before curving sharply to the right onto County Road E.
The modern intersection with County Road E.
Looking east on County Road E across the bridge over the Burlington Northern right-of-way, constructed in 1978. Looking back to the west down County Road E at the east intersection with Hoffman Road. This was the approximate site of the original junction with State Highway 244 from 1949 to 1953. Looking north on Hoffman Road from County Road E.
Northbound on Hoffman Road between County E and Cedar Avenue. This stretch is now a residential drive. The curve where the road meets modern U.S. 61 is visible ahead. The old highway continued straight across the site of the modern highway to the next stretch, accessible via the Cedar Avenue crossing. 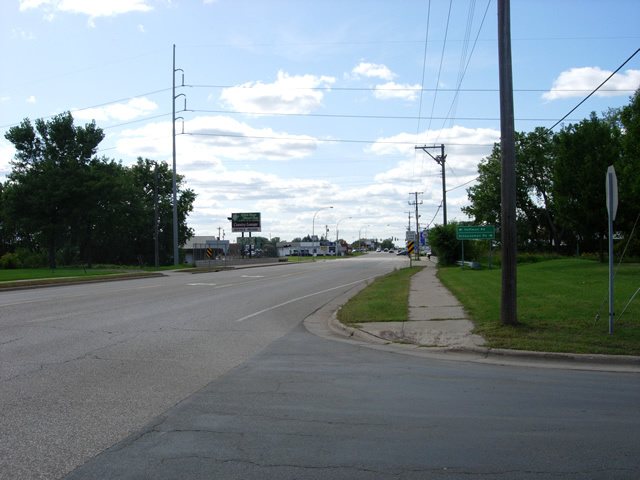 Looking south on Hoffman Road from Cedar Avenue after crossing to the other side of the modern highway. Looking north on Hoffman Road from Cedar Avenue. Another shot to the north, just south of the junction with County Road F.
Hoffman Road eventually curves along the west shore of Goose Lake. The Midwest Ski-Otters put on a water ski show here every Sunday at 6 PM during the summer (they were practicing while I drove by). 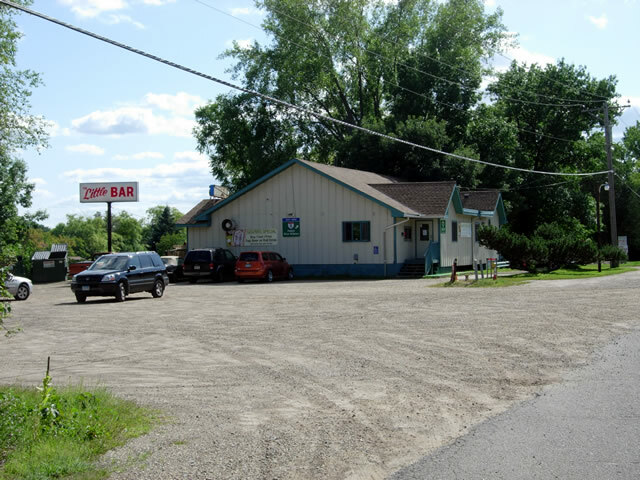 "The Little Bar", on Hoffman Road just south of County Road 65. Approaching the north end of Hoffman Road at modern 61.